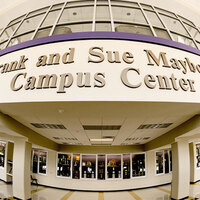 The Frank and Sue Mayborn Campus Center construction began in April 2003, and was dedicated on February 4, 2005. The new center includes the former J.E. and L.E. Mabee Health and Physical Education complex, which was built in 1957 and underwent renovations in 1980 and 1995. It includes classrooms and laboratories for the academic programs, an exercise/fitness room, an aerobics room, student and faculty dressing rooms, offices for faculty and coaches, and a student lounge. I got in a really good workout! This class is awesome. My first time attending a yoga class. The instructor kept reminding the class to do what you can; there is no judging; she was awesome. I plan on attending all of her class when my class schedule allows. Zumba was awesome! Alexus did a fantastic job leading it! I will definitely go again. Is he running for President in 2020? I hope so. It was awesome! I had a lot of fun. Awesome!!! Well executed. The various countries represented by the flags was really nice. Loved it! Thought that Dr. Kemp did an amazing job!